"My friend gave this to me once when I was at her house, and I tried it at home. You don't have to follow this exactly at all! You can add more strawberries, if you like." 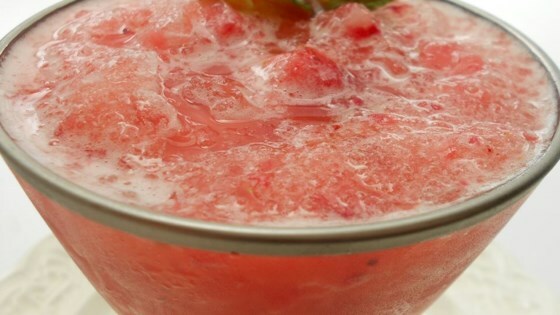 In a blender, combine strawberries, orange juice, ice cubes and sugar. Blend until smooth. Pour into glasses and serve. This is good but we liked it better with a banana. We can't get strawberries now so we use the frozen strawberries in sugar so we omit the sugar called for. Thank you. After I added the banana it was even better. I will continue to use this recipe! Thick, pretty and delicious. I used frozen strawberries, which I liked because I didn't have to dilute this with as many ice cubes to make this refreshingly cold. My 4 year old and 1 year old loved this recipe. We added blue berries, a banana, raspberries and a little more ice. It turned out to be a cool healthy treat for a hot afternoon. excellent! i added the banana as suggested and it was so good!